If you are learning how to make a peanut butter muffin recipe this first one is made easy with Bisquick baking mix. These muffins are delicious with either creamy or crunchy peanut butter. Peanut butter is one of America’s favorite flavors, especially with children so expect these muffins to be a hit with your children. Peanut butter has become a staple in the homes in America. It is as common as eggs, milk and bread. Not only does it make great sandwiches with jelly or as a spread on crackers, but it is used in a wide variety of recipes. Peanut butter cookie recipes and peanut butter fudge recipes are very popular. Besides sweet foods, peanut butter is used to make delicious salad dressings and sauces. Peanut products have been used for centuries but in the 1800’s other ingredients were beginning to be added to the peanuts to improve the flavor and texture. Sometimes sugar or molasses will be added for flavor. Most often oil is added to improve the texture and spreading quality. We are lucky to be able to buy here in the United States many peanut butter products. To many of us the crunchy peanut butter is our peanut butter of choice. Grease bottoms of 12 muffin cups or line with paper liners. Beat egg, milk and peanut butter until well blended. Stir in the baking mix and sugar just until moistened. Bake about 15 to 18 minutes or until golden brown. This recipe is made from scratch although very easy. The dates and orange juice gives added flavor to the already delicious peanut butter recipe. Lightly grease muffin cups or use paper liners. Sift the flour, baking powder, salt and sugar together; stir in the chopped dates. Blend the orange juice and peanut butter together until smooth. Combine the dry mixture with the orange juice mixture and stir only until dry ingredients are moistened. Bake about 15 to 18 minutes or until a pick comes out clean. Combine flour, baking powder and baking soda in small bowl. In large mixing bowl beat whipping cream, butter, peanut butter and sugar until smooth. Add to creamed mixture bananas, maple syrup, egg and vanilla; mix well. Add flour mixture; stir just until moistened. Fill paper lined muffin tins ¾ full; sprinkle with nuts. Bake 25 to 30 minutes until pick comes out clean; remove from pan. Combine in medium bowl flour, sugar, baking powder, salt and orange peel. Cut in peanut butter and butter until coarse crumbs; stir in cherries. In small bowl combine milk and eggs; stir into dry ingredients just until moistened. Spoon batter into paper lined muffin tins about ¾ full. Bake about 15 minutes or until pick comes out clean. Preheat oven to 375F degrees; line muffin tins with paper liners. Combine bran, raisins, oats and wheat germ in medium bowl. Pour boiling water over mixture; let set about 5 minutes. In large mixing bowl combine yogurt, honey, eggs and molasses. Blend in the peanut butter and oil; stir in bran mixture. Add dry ingredients to batter; mix just until blended. Fill lined muffin tins ¾ full; bake about 25 minutes. Preheat oven to 350F degrees; line muffin tins with paper liners. Combine cake mix and baking soda in a large mixing bowl. Add the peanut butter, water and eggs; beat just to blend. Fill muffin tins 2/3 full; place 1 teaspoon jam in center of each. Bake 18 to 23 minutes until pick comes out clean; serve warm. FOR BATTER combine in large mixing bowl flour, sugar, oats and baking powder. In another bowl whisk together milk, peanut butter, banana, egg, oil and vanilla. Stir liquid mixture into flour mixture just until blended; fill muffin tins ¾ full. 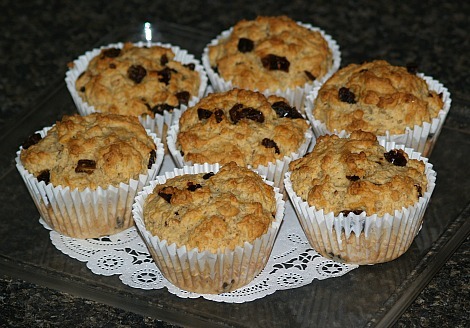 TO MAKE TOPPING combine all ingredients until crumbly; sprinkle on top of muffins. Bake16 to 18 minutes until pick comes out clean. Preheat oven to 350F degrees; line or grease muffin tins. Combine sugar, salt, egg and milk in large mixing bowl. Stir in peanut butter; mix until smooth. Add flour, baking powder and marshmallow to mixture. Mix until well blended; fill muffin tins 2/3 full. Spoon half teaspoon preserves in center of muffin. Sprinkle peanuts over the top. Bake about 22 minutes until pick comes out clean.